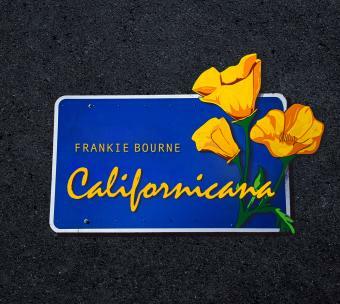 On his debut album, “Californicana”, native Californian singer-songwriter Frankie Bourne tells lyrical tales of wanderlust adventure along the California coast, with infectious Americana-vibe Indie rock songs that blend the sounds of American roots music and soulful 70’s rock ‘n’ roll with the moody melodic grooves of 90’s Adult Alternative music. Originally from the San Francisco Bay Area, Frankie became infatuated with music at a young age, teaching himself the drums and guitar, playing in bands and beginning to write songs at age 13. Most notably though, his taste in music went backwards. While American music was dramatically shifting at the turn of the century, Frankie was an old soul teenager heavily influenced by bluesy rock music from the 60s and 70s (especially after his aunt gave him her vinyl collection), as well as the 90’s Adult Album Alternative radio he grew up listening to. Collectively, this specific range of influence would blend together to help construct his Indie/Roots-Rock sound. After high school he made his way down the California coast through Santa Cruz, writing songs, jamming in garages and performing at every open mic he could find before eventually moving to Los Angeles where he wrote and arranged his 13-track, acoustic-laced debut studio album, “Californicana”. The album was co-produced by Bourne and LA producer Marc Danzeisen (Riverdogs, Powerslide, Gilby Clarke), and just released independently under Bourne’s own Robotic Records with a successful sold out record release show at the infamous House of Blues on the Sunset Strip. Frankie continues to aggressively play shows throughout Southern California in support of the album, both solo and with his band, with a follow up record already in the works, an upcoming Fall 2015 solo acoustic tour, and an eagerness to keep pushing his music to bigger stages. His album “Californicana” is available on iTunes, Spotify, Amazon, CD Baby and BandCamp, and is now featured on radio stations Sonoma Sun FM, Jango Internet Radio, Indie Radio Music, Relax Free Radio, The Mad Music Asylum, War Stories Radio, and UK based XRP Radio. In Summer 2015 Frankie will be a featured artist in Digital Earbuds Music Magazine.